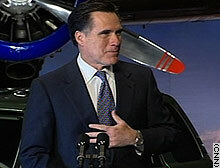 The Situation Online: Romney, Fred Thompson, next 'macaca' moment? It's March Madness and presidential candidate Mitt Romney is hoping college students will help him raise some campaign cash. Romney's son and daughter-in-law are spearheading "Students for Mitt," a new fundraising campaign that offers a 10% commission for students who raise more than $1000. Whoever raises the most money within three months wins a video iPod. Over the last month, Web sites have popped up across the Internet to rally support for a Fred Thompson presidential run. One site, DraftFredThompson.com, was so swamped today it crashed. Another site, Fred08.com is co-chaired by two Tennessee congressmen. The "Law and Order" star and former Tennessee Senator also has the support of former Senate Majority Leader Bill Frist. Thompson has expressed interest in a presidential run but has not officially entered the race. Watch "The Situation Room" at 4 PM, 5 PM, and 7 PM ET for these stories and more from our Internet reporters. WATCH "The Cafferty File" here. Would you vote for a 2008 presidential ticket that had the name "Bush" on it? Does Hollywood support help or hurt a presidential candidate? What warning label would you put on a country you've visited? The Cafferty File: Split with Saudis? READ your responses below, then WATCH "The Cafferty File" here. What message does it send when Saudi Arabia's King Abdullah calls the U.S. presence in Iraq an "illegitimate foreign occupation"? Should illegal immigrants be able to drive legally in the U.S.? Is it a waste of time to expect the United Nations to gain the release of Britain's captives from Iran? Will President Bush eventually have to accept a troop timetable in exchange for war funding? What's the appropriate punishment for ITT for sending night-vision technology to potential enemies? How much will candidates' private lives matter to you when voting for president? The Cafferty File: Why Take the Fifth? What does it mean when a top aide to Attorney General Alberto Gonzales decides to take the Fifth Amendment and refuses to testify in the federal prosecutor case? How should Britain go about trying to win the release of its captured sailors and marines from Iran? What does it mean if Republican Senator Chuck Hagel is using the word "impeachment" when it comes to President Bush? Alberto Gonzales is scheduled to testify before Congress April 17. Will he last that long as Attorney General? Why does a U.S. Senator need to carry a loaded gun? The Situation Online: Showdown at sea, another "macaca moment"? The Democratic Party is hoping for another "macaca moment" in the 2008 election cycle. In addition to digging into the backgrounds of Republican candidates, the DNC hopes to set up video crews to follow them around in early primary states. Can the Democrats harness the power of online video to help win back the White House? Britain is demanding access to the seized sailors and marines accused of entering Iranian waters. But what were Royal Navy ships doing in the Persian Gulf in the first place? The British Royal Navy's Web site explains the mission of the HMS Cornwall, which is there to protect offshore Iraqi oil assets. The Royal Navy has also posted up a map of Iraqi waters, where they claim the personnel were when they were captured.